Australia is a country, and it's also the smallest of the seven continents. It lies south of the equator between the Indian and South Pacific oceans. The country is fairly flat with very few high mountains and contains both rain forests and dry deserts. Its most famous tree is the eucalyptus. Australia is also known for its unusual animals. Most of them are marsupials, a mother who has an outside pouch where its young is carried. 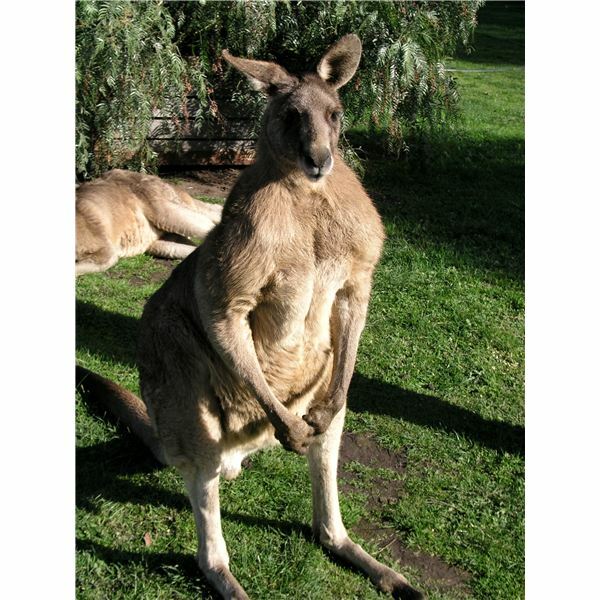 Kangaroos and koalas are the best-known marsupials there. Opossums and wombats are also common, along with a dingo, a wild dog that was brought to Australia by the Aborigine people. Along the northeast coast of this continent is the Great Barrier Reef that contains fish in beautiful colors and lush vegetation. This reef is more than two million years old and is made of hardened skeletons of dead sea creatures. Show children on a world map or globe where to find Australia. Australia's name comes from a Latin word that means "down under." People refer to this country with this nickname because it is south of the equator. Have any of your children been to Australia? If so, ask for the parents and child to share their trip and memorabilia. It's a big word but fun to say! A kangaroo is a marsupial where the mother carries her young in a pouch on her stomach. The kangaroo gives birth to a tiny offspring called a joey. For an art project, draw a template of a kangaroo on cardboard. Invite each child to trace around this template to make their own joey on brown construction paper. They can draw in the facial features with crayons or markers. Give each child two lunch size paper plates: one whole and one half from the second plate. The teacher can staple the half plate to the full plate to make a pouch. Don't forget to place tape over the staples to prevent scratches. When finished, have the children place the joey inside the paper plate pouch, which represents the mother kangaroo's belly pouch. Talk with the children about the other marsupial animals, and proceed with art projects with the other animals. A suggested idea would be to draw a Koala bear climbing up a Eucalyptus tree. Make a replica drawing of the Great Barrier Reef using colorful crayons on white paper. Tell the children about the countless creatures residing in this area. Draw rainbow-colored fish, bright shapes of coral, turtles, starfish, and vegetation. Lightly paint a blue tempera paint wash over the entire surface. This is called a crayon resist painting and is quite lovely to display. A variation is to cover the picture with blue cellophane and affix it with tape on the back. Christmas holiday activities in Australia are much like those in the United States except that the seasons are reversed. Christmas falls during the hot summer in Australia. You will see families decorating Christmas trees on the beach and spending the day swimming. Santa might be at the beach in swim trunks! Have the children draw Christmas scenes in sunny Australia; don't forget the sunglasses! Post these on the bulletin board and discuss the differences between Christmas there and here. Lamingtons are a favorite cake dessert in Australia. This sweet cake is named in honor of the Baroness Lamington of England. Make an easy version in the classroom. Cut store-bought pound cake into cubes. Melt chocolate chips in a microwave. Help the children to pierce a cake cube with a plastic fork and dip it into the melted chocolate. After it is covered, roll it in shredded coconut. Set these aside for a couple of minutes until the chocolate hardens or place into a refrigerator. Serve to the children and enjoy! The Australian people speak English with influences borrowed from the native aboriginal languages. Prepare a chart and incorporate some of these words in your classroom during your lessons about Australia. The children will have fun repeating these fun words and phrases. GOOD ON YA! – Good for you! Your preschoolers will love learning about the country and continent of Australia. Try to incorporate lessons about various countries throughout the year as this teaches young children about similarities and differences among people and cultures.